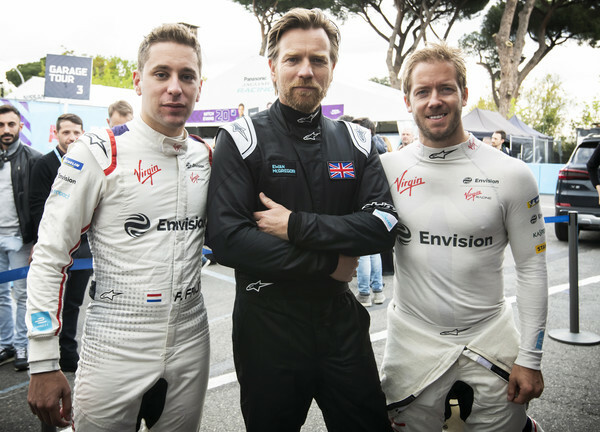 Drivers of The Envision Virgin Racing Team Robin Frijns and Sam Bird meet actor Ewan McGregor during the Rome ePrix of Formula E Season 5 on April 13, 2019 in Rome, Italy. Cybersecurity giant Kaspersky Lab is Official Sponsor of the Envision Virgin Racing team for the second consecutive year. Both grounded in technological innovation, Kaspersky Lab and Envision Virgin Racing share similar vision and passion in bringing innovation to customers around the world, raising the awareness on this innovative and futuristic all-electric racing series.